The amount agreed on the completed "Booking Confirmation Form" will be paid by your chosen form of payment. If the questionnaire is not received within 5 days The Fairies Toadstool reserves the right to re-open the allotted time to other clients. On completion of the booking questionnaire a $50.00 non refundable deposit is required. This can be paid for via Cash, Cheque, Direct Deposit or Credit card. There is no minimum number of children, however our package price does include up to 8 children. This being the case, you will be charged the standard package price if there is less than 8 children attending the party. Maximum number of children who can attend is 12 (twelve) including the "Party Girl". If the Fairy Tea Party is cancelled outside 3days before the nominated birthday date, there is no extra charge other than the non refundable deposit. Inside the 3 days $50.00 cancellation fee will apply. If due to bad/ extreme weather the party cannot be held outside and another appropriate location cannot be organised .Another date may be arranged at no extra cost. This is subject to contacting us and assessing the situation on individual case. The PURCHASER of the party must be contactable by mobile phone during the entire day of the event. Any car parking fees etc are to be paid by the PURCHASER as an additional cost. The PURCHASER must arrange for at least one other adult to be present for the duration of the Tea Party. The PURCHASER is responsible for the safety of the children for the duration of the Tea Party. The PURCHASER accepts that they are employing The Fairies Toadstool to perform in the contracted date and time that has been mutually agreed by all parties. If The Fairies Toadstool is delayed through sickness, mechanical breakdown or other such problems The Fairies Toadstool will arrive and perform for the duration of the contacted time and the fee will be reduced as a percentage of the missed performance from the full amount. If The Fairies Toadstool is delayed performing through no fault of The Fairies Toadstool , the PURCHASER understands that The Fairies Toadstool will finish the performance at the contracted finishing time that had been agreed and will be paid in full. The Fairy grotto tent, toadstool chairs, birthday chair and extra props used in the Fairy Tea Party. Remain the property of The Fairies Toadstool. The party inclusions are clearly stated in the party inclusions. 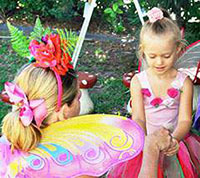 The Fairies Toadstool is only providing Fairy Tea and cookies for the guests nominated on the RSVP list. At no time is the Fairies Toadstool liable to provide any other catering or extras without prior arrangement. Contents of the Fairy/Pirate Gift bags may vary depending on the items in stock at the time of the party. I have advised The Fairies Toadstool of any food allergies or intolerance that any of the children attending the Fairy Tea Party have. The Fairies Toadstool will not be held liable if these allergies if they are not disclosed to us prior to the party. By replying The Read Terms and Conditions field on the booking form that is included in this same email you agree to have read, understood and accept the Terms and Conditions given by The Fairies Toadstool.